YANCHENG, China (Reuters) - An explosion at a pesticide plant in eastern China has killed 62 people, state media said late on Friday, with 34 people critically injured and 28 missing, the latest casualties in a series of industrial accidents that has angered the public. The blast occurred on Thursday at the Chenjiagang Industrial Park in the city of Yancheng, in Jiangsu province, and the fire was finally brought under control at 3 a.m. local time on Friday (1900 GMT), state television said. Survivors were taken to 16 hospitals with 640 people being treated for injuries, state media had said earlier. The fire at a plant owned by the Tianjiayi Chemical Company spread to neighbouring factories. Children at a nearby kindergarten were also hurt, media said. The cause of the explosion is being investigated, but the company - which produces more than 30 organic chemical compounds, some highly flammable - has been cited and fined for work safety violations in the past, the China Daily said. Police, some wearing face masks, sealed off roads to the plant. The blast smashed windows in the village of Wangshang two kilometres (1.2 miles) away, and stunned villagers likened it to an earthquake. "There was one loud bang followed by a long rumble," one, who gave his family name as Wang, told Reuters. "All the windows were smashed. I went to have a look. Near the site there was blood everywhere. People were crushed. "The village stands beside a murky mildewed pond and was built in 2013 for people displaced by the construction of the industrial park where the blast took place. Dozens of Wangshang residents work at the park, and many have not come home. Many buildings had broken windows and further structural damage, but villagers have not been evacuated. Unlike the police on site, none of them wore masks and had not been advised to. Authorities must step up action to prevent such incidents and determine the cause of the blast as quickly as possible, Xi added. The Jiangsu environmental protection bureau said late on Friday that a team of 126 inspectors found various degrees of contamination in local water samples, with nitrobenzene concentrations exceeding standards at one location. Some volatile organic chemical measurements far exceeded surface water standards - 15 times over in one case. Concentrations of acetone and chloroform outside the blast zone were also within normal limits, it added. 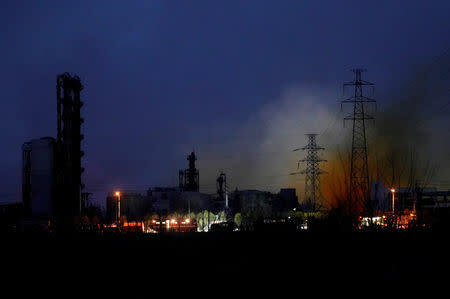 Jiangsu will carry out inspections chemical producers and warehouses, an emergency notice said on Friday. The notice, published on the news website of the province's Communist Party, said the government would shut down chemical firms found not to be complying with regulations on dangerous chemicals. Those blasts were big enough to be seen by satellites and register on earthquake sensors.